Did you know that in Jacobean London, there were 7,000 tobacco houses – more than alehouses and taverns combined? And that the “holy herb” was seen as a catalyst for creativity, cure for cancer, and a wholesome and nutritious breakfast for schoolchildren (even if it did ‘make your breath stink like the piss of a fox’)? All is revealed in Dr Matthew Green’s latest feature for the Daily Telegraph, which you can read here. The feature takes the reader on a journey into the heady, exotic world of the Jacobean tobacco house at a time when London was the smoking capital of the world and describes the first, doomed chapter in the sorry War on Drugs when James I tried to extinguish the “perpetual stinking torment” by increasing taxes by 4,000 % only to capitulate in the face of lucrative imports from the new colony of Virginia. It also includes some rather fetching images of early smokers. 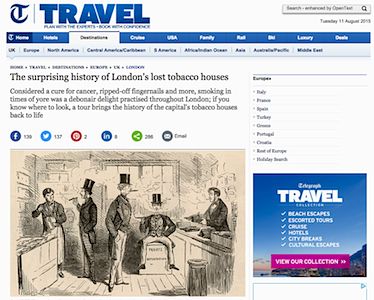 The article is part of the promotion for the recently-published London: A Travel Guide Through Time, in whose first chapter, set in 1603, the time traveller has the headrush of their life inside a Jacobean tobacco den. Find out more about the book here. Join the UCA Mailing List and receive our newsletter. Be the first to hear about new tours, events and talks! If you want to learn about stews, stinkards and Sackerson the bear, look no further. On this engaging tour Dr Matthew Green gives you the lowdown on Shakespearean London in gory detail. We were entertained, horrified and amused in equal measure. It was great to be learning things from such a knowledgeable expert, if only our school history lessons had been this much fun. The well-known places are brought to life with little known facts and there are less well known places off the beaten track thrown in, so I am sure that even the most well-read Londoner will go away with something new. Sometimes he is a little too good at making you feel like you have gone back in time when you are faced with the spectacle of what passed for entertainment in those days! What brilliant value for money. The tour was simply amazing! It provided a depth of information that was academically appropriate, but you delivered it with a style and flair that was highly entertaining for university students—they absolutely loved it. I told the class that I especially enjoy a “field trip” that teaches ME something, and yours did! The anecdotes and “tales” brought the early history of print media to life. Nice job! An unexpectedly fascinating tour, which takes you back in time through the medium of strong, invigorating black coffee. This would be fascinating stuff even if it were just a straightforward lecture, but at various points along the tour, actors jump out of the shadows and bring the story to life. giving a fascinating insight into the consumption of chocolate [in eighteenth-century London], this two-hour walking tour is a new initiative led by historian Dr Matthew Green. These chocolate houses were notoriously debauched places with smoky, candle-lit interiors, where the uber-rich socialised amid the intoxicating smells of sweat, perfume and bubbling cauldrons of chocolate.